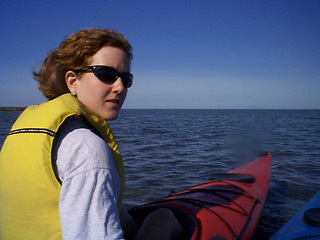 Hedy Edmonds is a marine geochemist at the University of Texas Marine Science Institute. She'll be leading the water column chemistry program, using CTDs to re-locate the hydrothermal plumes and guide the AUV deployments. Hedy was on the 2001 AMORE expedition that first found evidence of hydrothermal vents in the Arctic. I think my strongest at-sea food memories all have to do with breakfast. Scrambled eggs with this great hot sauce from Barbados that I discovered on a cruise in the mid-1990's became a staple for years. On my last Arctic cruise I worked nights (6 p.m. to 6 a.m.) so that breakfast was actually my big "dinner" meal. The four of us who worked that shift made a big deal out of our breakfasts (there really wasn't much to eat on that ship overnight), and there were made to order omelets on Sundays. Sometimes it seems like an accident - something that just happened. I was a chemistry major who loved the ocean, and wanted to figure out a way to do chemistry and go outside. I had no idea chemical oceanography even existed. But as for why I keep doing what I do, I'd say I still love the ocean. I think it's fundamentally important to know how the planet works if we are to take proper care of it, and I love that my job is to learn things that nobody knew before. Greenwich, Connecticut, for the most part. Until I was nine, my family lived in Washington, DC and various parts of the Middle East because my father worked for the US State Department. Advice for kids who want to be oceanographers? Learn lots of science, spend time outdoors, and learn how to fix things. When stuff breaks at sea, you only have the people and the parts that are on board that ship to help you fix it.